On March 9, 1862, the U. S. Monitor ended the greatest threat to the Union's Civil War effort, up to that time, by repelling the Confederate ironclad warship, Virginia, as it began a destruction of the ships of the Union blockade in Hampton Roads. However, the victorious Monitor was not the property of the U.S. Navy or even the property of the United States Government. It was, in fact, the personal property of John Flack Winslow. An industrialist from Troy, New York, John Flack Winslow was proclaimed "a benefactor of the nation" following the battle and was widely celebrated, both in his home state of New York and in Washington, D.C. Although he died on March 10, 1892, a newspaper article published thirty-six years later still referred to him as Captain Winslow, the designer of the Monitor (see An Auction, paragraph 3). Winslow's contribution to history was managerial, not military. 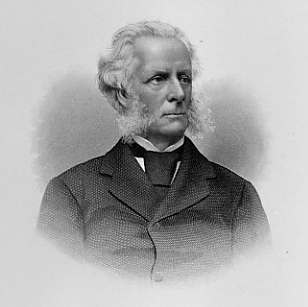 While on a trip to Washington, D.C., Winslow was approached by Cornelius S. Bushnell, a ship builder from Mystic, Connecticut, who was acting as agent for John Ericsson. Bushnell and Ericsson had tried to interest the Navy in the Monitor but had been rebuffed. Winslow was already doing ironclad shipbuilding business with the U.S. Government (the Galena) and was acquainted with John Seward, the Secretary of State as well. Seward arranged a meeting with Abraham Lincoln and Winslow argued in favor of the Monitor project. Lincoln indicated his approval, then left the meeting. During subsequent meetings, the Navy resisted the project but finally approved it but without funding in a final effort the sabotage the matter. Largely out of frustration, Winslow arranged to pay for it himself. See An Autobiography, pages 21 to 44. A contract was signed October 4, 1861 for $275,000 (Appendix A, pages 44 to 51) and construction began rapidly. Interim reimbursements were made by the Navy during construction but by the time of the battle the final payments had not been made. Therefore, the Monitor remained the property of the de facto lien holder, John Flack Winslow. John Ericsson is widely believed to be the inventor of the revolving gun turret. Actually, the turret was patented on January 18, 1843 by Theodore R. Timby, who got the idea from the Battery in New York harbor. Winslow paid a royalty of $5,000 to use the device on the Monitor. Winslow says Ericsson never patented anything on the Monitor except a mechanism for opening the gun turret doors. Winslow also alleges that Ericsson had his diaries destroyed at his death, thus avoiding any scrutiny into that matter, or any others. John Flack Winslow's first wife died on December 9, 1861, just two months after construction began on the Monitor. The marriage was childless and it appears, from a tombstone inscription, that he may have adopted his brother's son, who died at the age of twenty-seven, in 1877. He remarried in 1867 and had two daughters. One died in childhood; the other married and had a daughter but this girl left no progeny. He adopted this second wife's nephew soon after the boy's birth in 1883, upon the death of the mother. This son, Thomas Scudder Winslow, had three children, all with living descendants. John Flack Winslow moved from Troy to Poughkeepsie in 1867 and died there on March 10, 1892, thirty years and a day after the battle in Hampton Roads. His second wife died in Poughkeepsie January 18, 1926. Wood Cliff and An Auction address events at their Poughkeepsie estate, Wood Cliff, but offer historical information parenthetically. "John Flack Winslow and the Monitor," was written by the husband of a niece of the second Mrs. Winslow and was printed privately. There is no public memorial to John Flack Winslow except, it is said, for a small plaque near the Lincoln Memorial in Washington, D.C.